No more manual work in your software releases. TL;DR Run npx automate-release . A release might seem just an irrelevant number, but here you&apos;ll find why you should be using it. Release software is part of our developer day, but we tend to run it manually just we remember it, being a source of errors. Nowadays, we have the best tools to automate this task so let&apos;s use them. Tip: You can use a different convention configuration. Using a git commit convention for our git messages help us all the messages of the contributors have a homogeneous appearance. In addition, because we are going to use the same pattern for all the git messages, we can use that for do extra things, like for example, classify commits correctly at CHANGELOG.md or determinate what is the next version to release based on commit history. For ensuring all git messages follow the same pattern, We are going to use commitlint for linting git messages. It&apos;ll force you to follow a strict format into your git messages. You can&apos;t do the commit until the format is valid. (Actually, you could bypass this step using the --no-verify option, but avoid do that). Tip: Read more on Angular contribution guideline. build: Changes that affect the build system or external dependencies. ci: Changes to our CI configuration files and scripts. perf: A code change that improves performance. refactor: A code change that neither fixes a bug or adds a feature. style: Changes that do not affect the meaning of the code. test: Adding missing tests or correcting existing tests. I know. really, I know. The first time you use a convention for commits, you might think that it&apos;s over-engineering. But, after use it a bit, it&apos;s very helpful, It makes easy read all the commits quickly or just focus in a determinate type of commits. Now that we have a git commit convention, we can jump in the next thing, that will make our first release . For do that, we are going to use standard-version. After reading your git history and it will determinate what is the next release version. 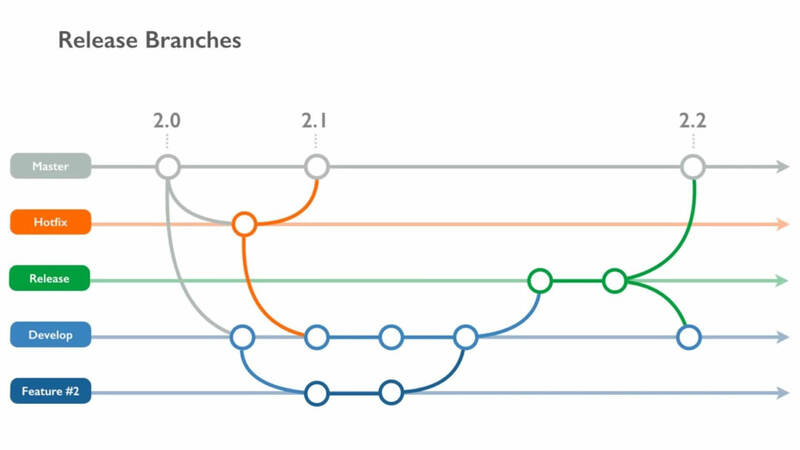 standard-version will determinate automagically the next version to release based on your git history.  Increment the version at package.json. 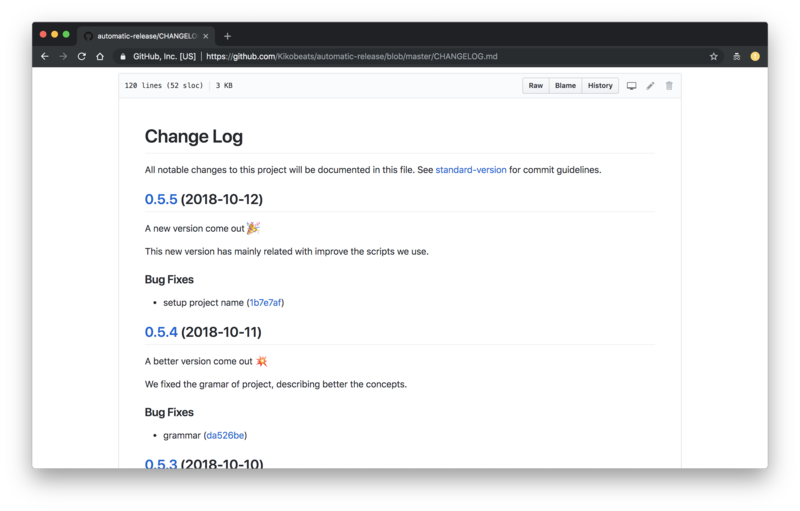  Create a new specific git commit for the released version.  Create a new git tag with the version associated. 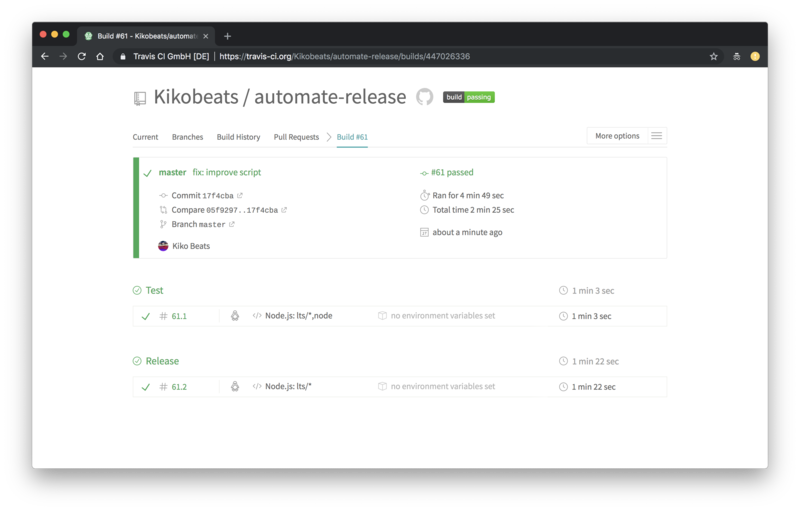 In addition, GitHub usernames (@kikobeats) and issue references (#133) will be swapped out for the appropriate URLs in your CHANGELOG.md. A good practice is to put the command as npm run release script for performing the action. As you can see, we associated push things into your master remote branch. So, next time you want to do a release, just type npm run release (make sense, uh). The CHANGELOG.md follows Keep a Changelog specification. You can write into it and your words will be preserved between versions. When you push a git tag, it will appear here, but nothing more. No text or changes associated. Now that we are generating a CHANGELOG.md it would be interesting to reflect the changes associated with each version. We can use a tool called [releaser-tools] (https://github.com/conventional-changelog/releaser-tools) who will do exactly that, leaving our release section pretty . Note: Remember to setup CONVENTIONAL_GITHUB_RELEASER_TOKEN. You can use direnv for declaring local development variables. "release:tags": "git push --follow-tags origin master"
The human behavior in a release process is very limited: we only have to trigger the release action. After that, all is automated 烙. But what if I say you we can eliminate the human behavior from the release equation? The premise will be that, every commit on your master branch will mean that a new version of your software will be released. The right place to do this is as part of our Continuous Integration. Every time a new Pull Request is merged in our master branch, our Tests will be executed to determinate if all is fine (nothing new here). 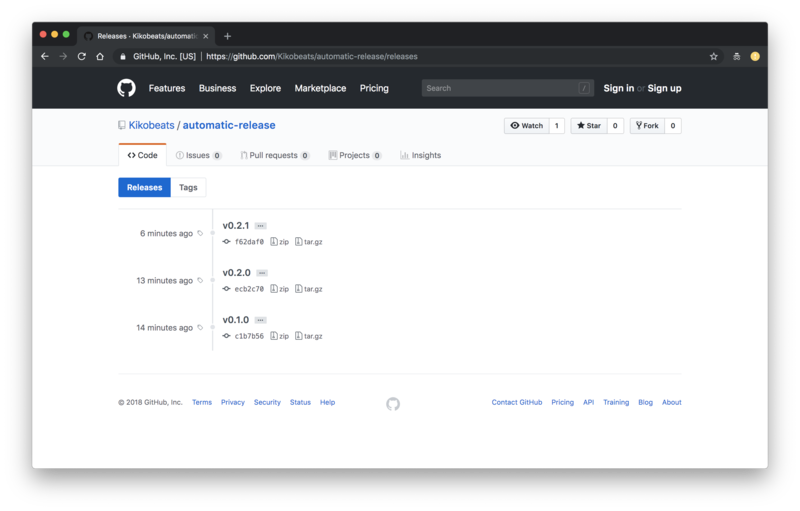 But now, after that, The Release stage will be executed, that will perform our npm run release command to complete the action. Have you noticed that? 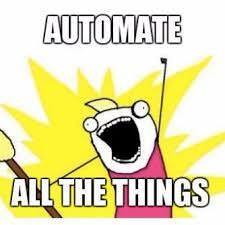 It&apos;s the sweet sensation of automation. That&apos;s specially helpful as maintainer if you are already have automated part of the process that uses services such as Greenkeeper to keep your dependencies up to date, that create PR very often if you have many dependencies or they are updated very often (something that happens all the time at NPM ecosystem). 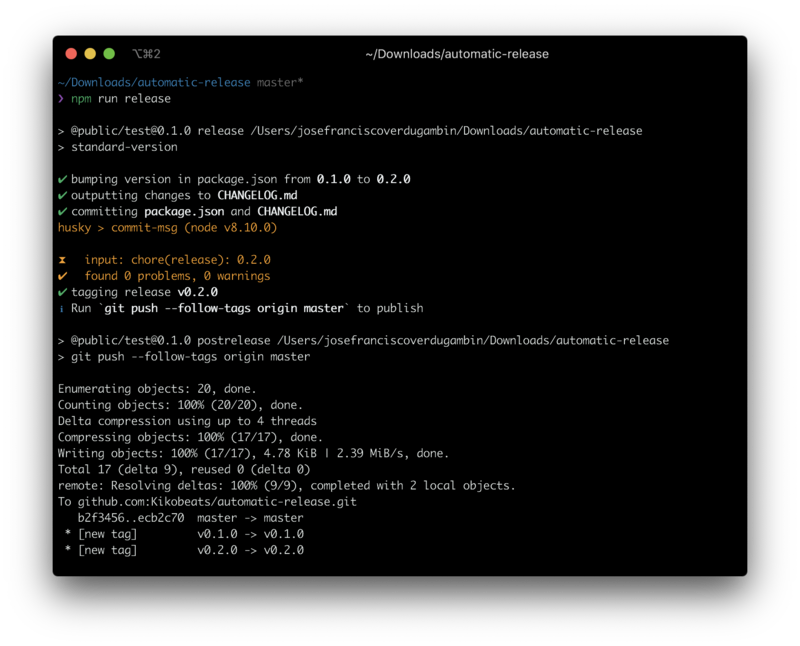 You can see .travis.yml to see how it is done or just run npx automate-release to install it in your project folder. Releases also is a way to establish a compromise with your audience in order to know what&apos;s news. From now GitHub brings the ability to subscribe to any repository for getting notifications related with new versions. Alternatively, you can get release information from different sources and connect it with third party services using different ways. Just you need to recover the latest release and publish it on other channel using an intermediate service that connects it over Twitter, Slack or where your audience is. GitHub API – For recovering information per owner_name/repo_name. GitHub RSS Feed – For getting atom feed per owner_name/repo_name. 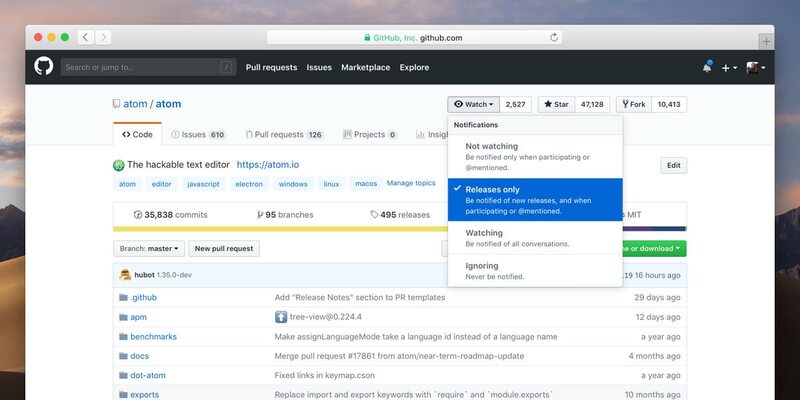 CodeRelease.io - GitHub Release Notifications on Your E-mail. IFTTT / Zapier – For declaring using RSS-to-Slack recipes or similar. @github_releases_notify_bot – Telegram bot to receive release notifications. tom.js.org – A tiny microservice for sending notifications using multiple channels (Slack/Twitter/Telegram/Email).